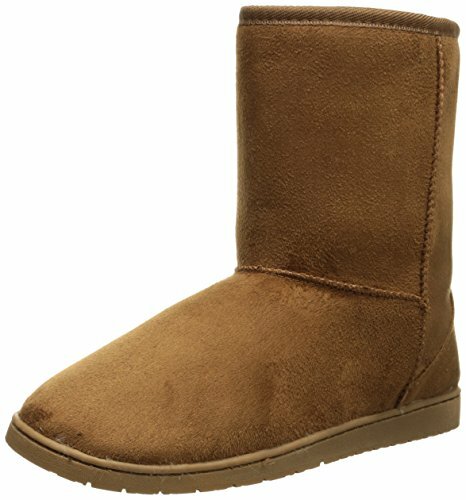 Looking for a pair of Vegan Ugg Style Boots? We've compiled 6 of the best on the market that we think you'll like even better than the real thing. We promise they're just as comfortable and will keep you just as warm. Without further ado, let's check out some of these boots. There's no reason you can't enjoy Ugg style cruelty-free with these deluxe vegan microfiber and faux shearling boots in chestnut brown. 9" boot with a slip-resistant rubber sole for good traction on the ground. Memory foam insole is cushy and supportive. Microfiber is water-resistant to keep light snow from soaking through. 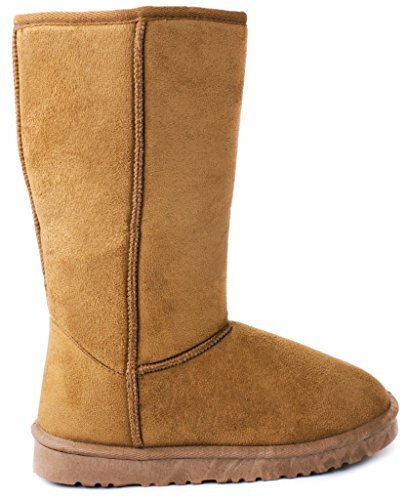 Pros: Uggs are neither vegan nor inexpensive...these are. They're so comfy you might not want to take them off. Rock the slipper boot and leggings look or wear any of those dresses you can't find a winter boot to go with. Cons: These are built for light activity only, so you'll have to leave the deep snow trekking to sturdier winter boots. Taller than a traditional Ugg boot, this soft, suede-like boot rises to about the mid-calf point to keep your leg feeling warm and cozy. 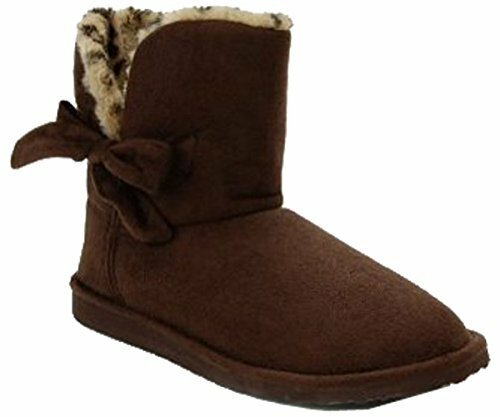 Rich chestnut brown with white faux fur trim along the outer length and across the ankle. Lined with downy vegan shearling and a lightly cushioned insole. Black synthetic sole is slip-resistant for steady walking in the wintry elements. Advertised as vegan: No, but all materials used in these boots are man-made. Pros: For a fraction of the cost of Uggs, you get a pair of snuggly winter boots that go fabulously with jeans. They're light and super posh-looking, so lounging around the house will feel a lot more luxurious. Cons: Some reviewers find the soles a little thin. We recommend these as house shoes that can double as casual outdoor boots. Let your inner wild child out. The folks at Soda bring you a funky spin on an Ugg-style boot in chocolate brown synthetic suede and leopard print faux fur trim. Lined throughout the inside with leopard faux fur. Secured with a vegan suede bow on the outer side of the boot. Made with a cushioned insole and padded footbed for long-lasting comfort. Outsole is textured for traction. Pros: Who says you have to sacrifice comfort for fashion? Go ahead and mix and match patterns and textiles. These boots are meant for getting creative. P.S. — leopard print is in. Cons: Not the hardiest winter boots — best for mild winters and casual trips to the grocery store. Variety is the spice of life. Here's a winter slipper bootie that takes the basic Ugg concept and revs up the style with a gray knit front, an Aztec-inspired design in the back and allover knit stitch accents. Pull-on style for the simplest wear. Lined with plush vegan shearling. Rubber outsole is treaded for grip under your foot. Advertised as vegan: No. The vendor lists all synthetic materials. Pros: These slipper boots are made for cloud walking. No need to change shoes to duck out to the store. They're fantastic as indoor/outdoor footwear and would look so fresh with bold colors and corduroy. Cons: They might be a little squeaky on laminated surfaces. Guess does Ugg style the high-fashion way: lavishly wrapped in white faux fur from cuff to ankle. Honey brown suede-like boot material is velvety-soft. Faux fur lining provides plenty of warmth. Boot rises to about shin height. Features crisscross straps with gold hardware and a rhinestone-encrusted Guess logo on the outer side of the boot. Advertised as vegan: No, but these boots have a 100% synthetic design. Pros: Fashionista footwear dripping with swag, flashy in all the right ways. They'll dress up your jeans and complement a chunky knit sweater and cowl neck scarf. Whether it's date night or you just want to look good walking the dog, these boots offer dress-to-impress style without the effort. Cons: They may have a bit of a break-in period. A gray Ugg-style boot that strikes a balance between dressy and casual with fluffy faux fur trim and neutral tones. Dark gray boot body contrasts nicely with the silvery faux fur trim. Cute pom pom ties wrap stylishly around the leg. Inner lining is toasty and snug. Boot is waterproof for snow-frolicking. Soles are thick with deep treading for stability on slippery and uneven surfaces. Advertised as vegan: No, but only man-made materials are used in the construction of these boots. Pros: Comfortable to wear all day and easy to clean (just throw them in the wash). They're great if you have a little bit of a commute on foot to school or work and you can't bear the thought of taking off your sippers. Wear these through the fall, winter and chilly spring days with miniskirts and knit tights. Cons: Some reviewers have disagreed about how waterproof these boots actually are. It might be a good plan to give them an extra waterproofing coat just to be sure.